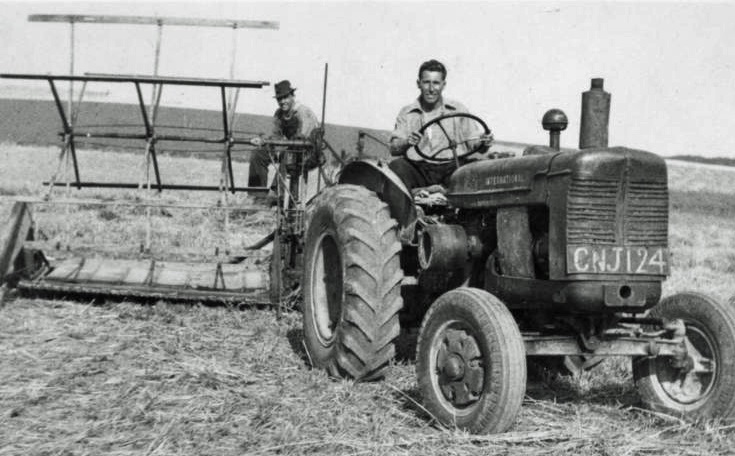 To ‘make hay’ and ‘bring in the harvest’ sound like idyllic past times, but this talk shows just how tough life was on a South Down farm near Lewes during the 1950’s – a time not yet beyond living memory. The war was over, but the battle was still being fought to feed the nation. Ian’s talk is illustrated by an original cine film, made by the farmer’s son. The film features Ian’s father as one of the farmworkers on the farm concerned. 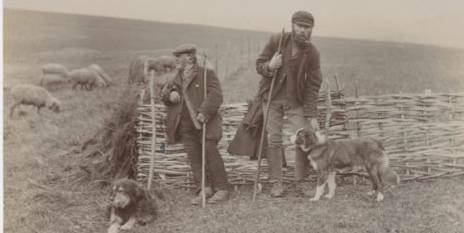 Ian is a well known lecturer on agricultural and social history in Sussex and an excellent speaker with first-hand knowledge of this subject. The letter below was written on 11 March 1771 by Thomas Kemp of Lewes to George Brooks, the steward to Dr Richard Trevor, Bishop of Durham and owner of Glynde Place. It survives in a bundle of other estate correspondence [ESRO Acc.8439/17/1]. “I have been informed his Lordship would dispose of the Tenement in Market Lane in the occupation of Benj. Blaber – have no View in buying the House but having a garden adjoining would not be troubled with a bad Neighbour for the sake of so small a Purchase – should be glad to know the price of the House if agreeable to his Lordship to dispose of it – have not examined the House but should suppose by the dismal appearance it makes it would require the present real value expended on it to make it in decent repair. I remain Dear Sir your Most Humble Servant. The Bishop’s steward replied to the effect that if his Lordship decided to sell, then Kemp should have the refusal. Thomas Kemp (c.1745-1811) was quite a young man at this date, though a wool stapler of means. He was elected MP for Lewes in 1780 as an independent and served continuously in that capacity until his death in 1811, with the exception of a gap from 1802 to 1806. His son Thomas Read Kemp (1782-1844) succeeded to his Lewes seat and was the creator of Kemp Town, Brighton. 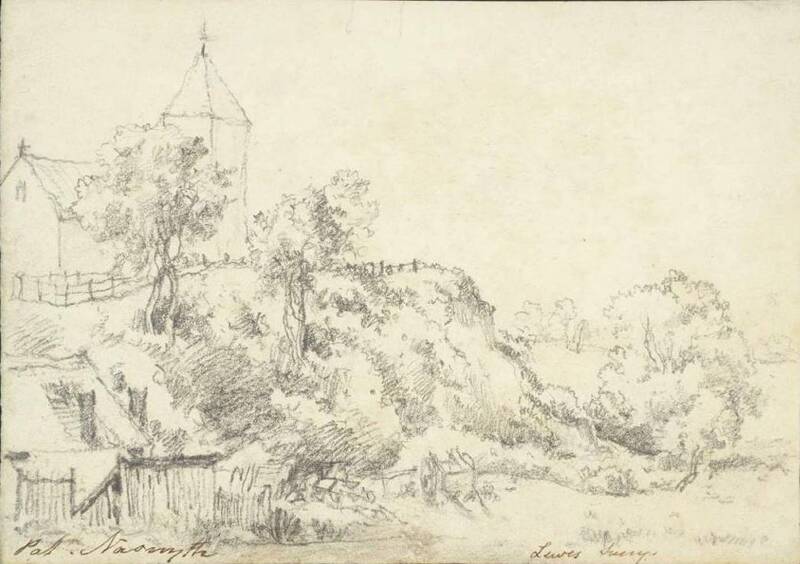 This drawing by Patrick Nasmyth (1787-1831) shows (though it does not name) the old Saxon church of St John-sub-Castro. This venerable building was replaced in 1839, on a different site and with an unusual orientation, by the present much larger church then needed to accommodate the parish’s burgeoning population. The drawing illustrates very clearly the elevated and defensible position of the old church, perched above the floodplain now to be redeveloped as the North Street Quarter. St John-sub-Castro, struggling in recent years, has recently embarked on a new life as part of the flourishing Trinity church, linking it with Southover and South Malling. Its large and perhaps over-wooded churchyard is one of Lewes’s most under-appreciated assets. The 1870 Education Act established a system of non-denominational School Boards to provide education in those areas where the voluntary system of Anglican National Schools and non-conformist British Schools could not meet demand. The 1880 Education Act finally made education compulsory for children between the ages of 5 and 10 but did not command universal support. By 1893, when compulsory education was extended to eleven year olds, actual attendance rates were only about 80%, despite the efforts of a dedicated corps of school attendance officers. A March 1893 Sussex Express illustrates the situation in Lewes. The established system of National and British schools in the town was struggling with capacity issues. The system depended on voluntary subscriptions from well-intentioned people. The newspaper reported that the annual report of the Government Inspector was awaited with concern, as it was probable that additional accommodation would be needed, especially in the town’s British School. It was feared that, as the existing schools were already struggling to find sufficient subscribers, the need for a School Board to supplement the town’s voluntary schools might be imminent. The annual accounts of the St John’s Day School, published in the parish magazine, illustrated the issues. The accounts for the year ending on 31 January 1893 showed a balance owed to the treasurer of 6s 11½d. Expenses had been heavy, due to the need to provide a new infant gallery and sanitary requirements, and an unavoidable increase in the salaries of the assistant teachers. The previous year’s positive balance had been wiped out, and the liberal help of the subscribers was needed to set things right. There were 88 subscribers in all, with two providing £3 or more, another twenty for between £1 and two guineas, but the majority subscribing half a guinea or less. There were also problems with attendance. An editorial in this newspaper fulminated: “It has long been considered a standing disgrace that parents should have to be summoned before they will send their children to school, and Lewes appears to be not wholly free from obstinate and misguided people of this kind”. The comments related to the case of a woman called Harriett Pinyoun of St John Street, who had been taken before the Lewes for the fifth time, and had also received no fewer than 25 warnings from the Town Council’s School Attendance Committee. It was thought that she found it cheaper to pay the fines than to send her child to school. Harriett Pinyoun ignored the summons but the Town Clerk, Mr M.S. Blaker, prosecuted the case in her absence. The magistrates gave her only two alternatives. Either she must send her son John to the British School regularly or the matter would be taken out of her hands, and he would be sent to a certified Industrial School. These were boarding institutions provided for the care of neglected, orphaned or abandoned children and juvenile delinquents. Their regime was a strict one, with the children rising at 6 a.m. and sent to bed at 7 p.m., and a highly regimented daily programme. 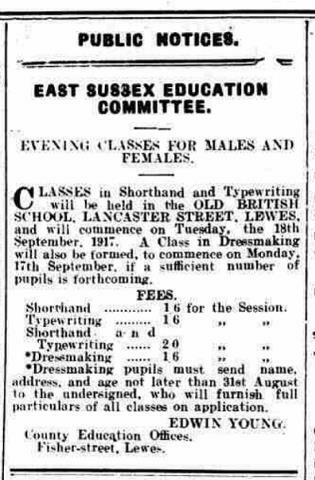 In the 24 Aug 1917 Sussex Express the County Education Office advertised evening classes for both males and females in shorthand, typing and dressmaking, to start in the following month. The classes were organised by the East Sussex Education Committee, and were to be held at the Old British School, Lancaster Street. The class fees were significant, given wages at the time, at 1s 6d per week, or 2s 0d per week if both shorthand and typing were taken together. 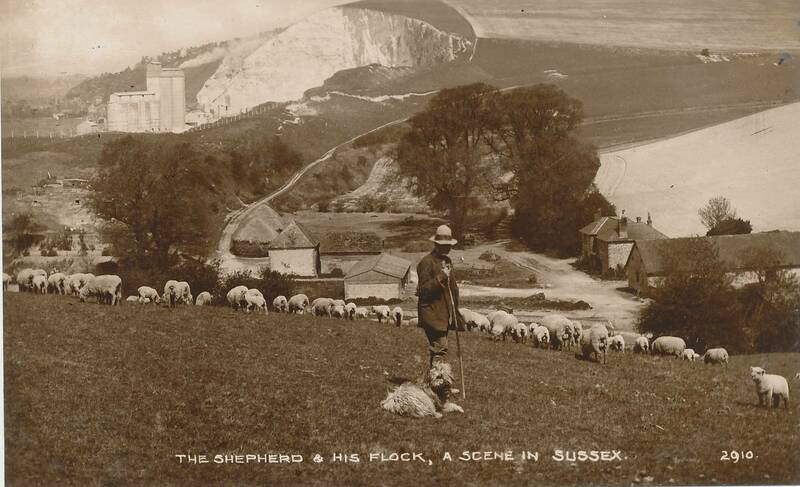 This postcard shows a shepherd and his dog watching over a Southdown flock just above Southerham. In the distance can be seen the Southerham chalkpits and limeworks. The publisher is not named. 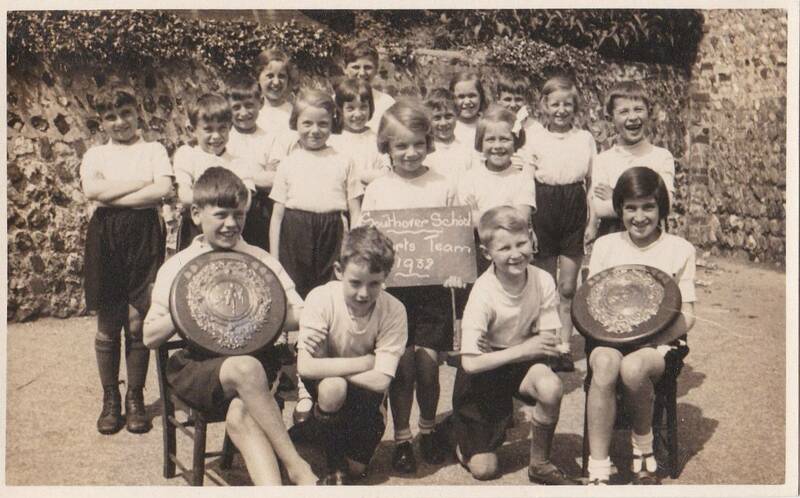 This postcard featuring the Southover School sports team for 1932 and their shields was the subject of spirited bidding. Uckfield & Lewes DFAS is a member of the National Association of Decorative and Fine Arts Societies (NADFAS) which works to advance decorative and fine arts education and appreciation, alongside promoting the preservation of artistic heritage. Locally we have ten lectures throughout the year from experts in the field of decorative and fine arts. We also arrange visits to places of artistic and historic interest and members can take part in regional events. Anyone is welcome to come to the meetings & membership for the year (Sep to Sep) costs £40. This gives free admission to talks. If you wish to have a taster you can attend a lecture for £7, which is refunded if you become a member at that meeting. This entry was posted in Agricultural History, Art & Architectural History, Education History, Lewes, Local History. Bookmark the permalink.